It’s a bitter truth that even if consider only the Punjabi community in particular, then also a big percentage of the youngsters might not be aware of blessed soul lovingly called BHAGAT PURAN SINGH, who spent his entire life for the physically challenged and the ignored sufferers of our society in his Pingalwara situated in Amritsar (Punjab). So where almost everyone knows about MOTHER TERESA and probably about the respected BABA AMTE too (included in our text books), there only a limited section of Indians are aware of this unique spirited personality who never felt ashamed to even beg for his big family of dependents living a comfortable life only because of him as their GOD-sent messiah. But before talking about the film, I would like to mention how I got introduced to his Pingalwara in the early 90s as it was indeed an enlightening lesson for me in those energetic years of college studies. At that time of the decade, we were into doing musical stage shows with a high end sound setup and as a routine ritual during those shows, people willingly used to throw currency notes over the singers and dancers during their individual performances. So by the end of the show, the stage would have several notes lying on it waiting to be picked up by an attendant. And our show-organizer was very particular about this collected money from the stage and had a habit of keeping it separately in a different bag that was honestly not liked by a few in the group willing to share it. So one late night, I finally decided to ask him about it and he said, “I don’t take this extra earned money home and the amount collected from the stage is all sent to Pingalwara in Amritsar”. That was the day I heard about Pingalwara for the first time and then came to know many more things about Bhagat Puran Singh from our organizer who was a big fan/supporter of his and still does the same social practice even today. Coming back to the film, it’s indeed a worth watching attempt in the biographical genre, intelligently following a non-linear progression that successfully makes an impression in its very first sequence itself. Yes, the prolonged background sequences do take some time to take the story forward and the choice of child artist in the initial 20 minutes could have been much better. 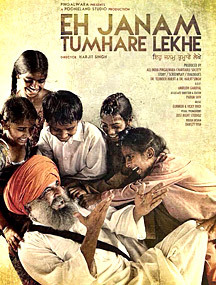 Still the film is able to make an instant emotional connect with the viewers before the intermission and then wins you over completely in its second half which has much more power in its depiction when Bhagat Puran Singh grows older walking towards his ultimate salvation in her mother’s arms. And as I have always said, when a film’s second half is stronger than the first then it is bound to become a winner in most of the cases. Further moving much ahead than being a simple biographical movie, EH JANAM TUMHARE LEKHE actually becomes a must watch, not to be missed gem due to some exceptional, unique features handled brilliantly by the writer, director and the actors together as mentioned below. A. Though Bhagat Puran Singh was not a born Sikh, the film doesn’t give any mileage to the fact rightly and explains this with a simple few lines dialogues in its second hour without giving it any major emphasis (as it should have been done becoming its biggest merit). B. It doesn’t talk or propagate about any particular religion thankfully, nor does it purposefully focus on the trust asking for some extra attention from the viewers through any deliberate sequences. C. The director quite skillfully incorporates two major events of the 20th century, i.e. of 1947 Partition and 1984 Blue Star Operation without any forceful provocation or taking sides. 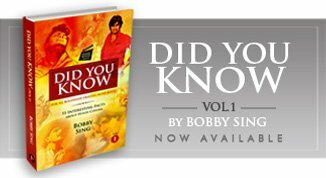 The sequences simply portray what in reality happened with Bhagat Puran Singh in those times and then leaves the decision on to the viewer that whether he did right or not in his personal dilemmas faced. E. Talking about the man who plays the role of Bhagat Puran Singh, one of the most underrated and underutilized talented actors of our times, Pawan Malhotra, I would only like to say, that you will find it tough to find Pawan in the entire film, especially in its second half. In more clear words, Pawan is simply not there but Bhagat Puran Singh is. And that’s the biggest compliment possible for an actor as far as my understanding of acting goes. Pawan completely dissolves himself in the character he is playing and you amazingly have to remind yourself in a repeated mode that here we have an actor playing a role and not Bhagat Puran Singh himself on the screen as it seems. The credit for this unarguably goes to the director Harjit Singh too for giving Pawan those precise instructions and guidance to deliver such a magnificent performance that is sure to be included as one of his best till date without any doubt. In short if music/background score and cinematography is the backbone of the film then Pawan is the life and face of the project lighting up every single scene of his with a sheer brilliance. Next writing about the immensely blessed soul Bhagat Puran Singh, a few lines cannot justify or explain the enormous amount of social work done by the man in his entire life. Hence I would only like to quote few of his important dialogues in the film that might give you an idea about the visionary person he was, capable of looking deep into the psyche of both the man and the nature together like a highly learned scholar. In one of the scenes, as he once visits the house of a college Principal for lunch, he notices almost the entire house made of wood unnecessarily. On getting no justification of the act from the Principal, he refuses to eat in that house where the people don’t care about the trees and nature around. And this, he used to teach 3-4 decades back when the world was not even concerned. Bhagat Puran Singh did not prefer travelling in cars and other local vehicles as he said they were polluting the surroundings much more than the comfort provided. And again he used to talk about the growing pollution and disturbing changes in climate long before the world took it as a serious issue in the 21st century. “Dont come to Pingalwara just to see....this is not a Zoo.......If you want then come here to do Seva... only Seva (Service)". For him there was no difference of any religion, caste, colour or region in life, explained in a simple few words expression saying, “Dukhan Di Zaat Nahin Hundi" (Sorrow has no caste or religion). And that’s exactly what the film teaches you in its two enlightening hours that life isn’t just about any religion, any caste divisions, any clashes or silly ego fights. Life is about sharing whatever you can with the less privileged around as nobody is here to stay permanently. Life is about helping the needy and living harmoniously with the nature taking good care of it too. Life is about awareness with an acceptance that we are here just for a few years only to walk back home to the eternal source after our granted time is over. The film makes you shed tears at several instances and teaches you these valuable lessons of life with an important mix of a meaningful theme, a fine direction, an outstanding lead performance and some great melodious music. Hence do watch this eye opener biography at the earliest and do yourself a favour. Rating : It’s a project straight moving into my “Movies To See Before You Die” list for the man, world surely needs to know about, BHAGAT PURAN SINGH of Pingalwara and Pawan Malhotra. Looking at the response, its sad to see that just a couple of months back The Sikh Community stormed the theatres to see an animation film CHAAR SAHEBZAADEY due to the RELIGION factor involved in it......! But they couldn’t find time or willingness to watch this enlightening gem proving that its Religion that sells a lot more than life teaching films in reality. To say the truth, you displayed a strange contradiction dear Punjabi friends as it is EH JANAM TUMHARE LEKHE that actually talks about the REAL RELIGION to be followed........ living the Guru's teachings practically..... but you sadly missed the bus. Grand portray by actor n director.. Marvelous write up by u.. Thanks a lot for your kind appreciation and thoughtful effort to spread the good word about the worth watching film sharing the review Prof. Kulwinder Ji. As a community are we more obsessive with concept of being a Sikh (inspiration for Char Sahibzade) than being a human being(inspiration for Eh Janam Tumare Lekhe)? Thanks a lot for appreciating the review and yes you are very right as its quite evident that people enjoy and feel proud to be a Hindu, Sikh, Muslim or Christian much before feeling the world around as a human. And probably that's the very reason, why the whole unrest in this world is somewhere caused by this one word called Religion only.....unfortunately.